Back when I started trying to watch all of the Lupin III titles, I was dismayed to see that the 2001 Lupin III: Alcatraz Connection was not only not licensed, but no fansub group had picked it up either. To be honest, I figured it would be one of those titles I’d never get to watch. However, Discotek did eventually license the title. And thanks to a couple of request from readers of my blog, I decided to go ahead and pick it up to watch. The Lupin III: Alcatraz Connection TV special starts with Lupin, Jigen, Goemon, and Fujiko targeting the mafia owned, casino cruise ship Machine Gun Kelly. Zenigata is onto the plot and arrives in time to prevent Lupin from escaping with the giant vault of cash. However, Lupin drops a special paint bomb into the vault before they flee. 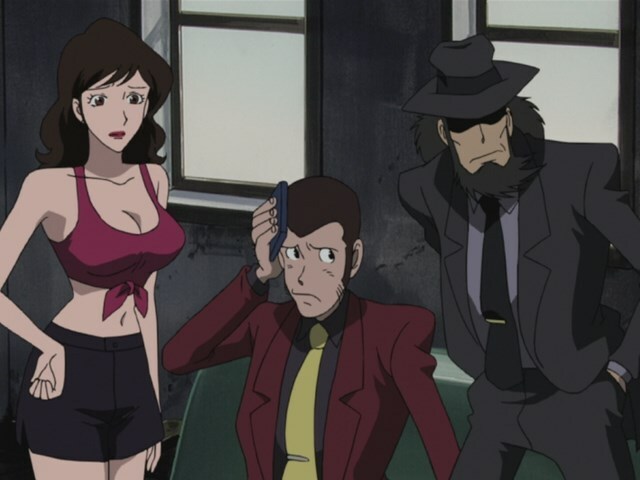 Once the gang arrives at their hideout, Fujiko is unhappy at having lost the loot. However, her attitude changes when she learns that Lupin’s true objective was data on the Yankee Slade, which sank in 1854, laden full of gold bars. Men in black attack the hideout, forcing the gang to flee. 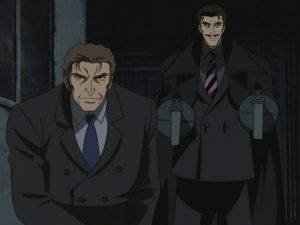 However, Lupin is captured by a mafia guy. 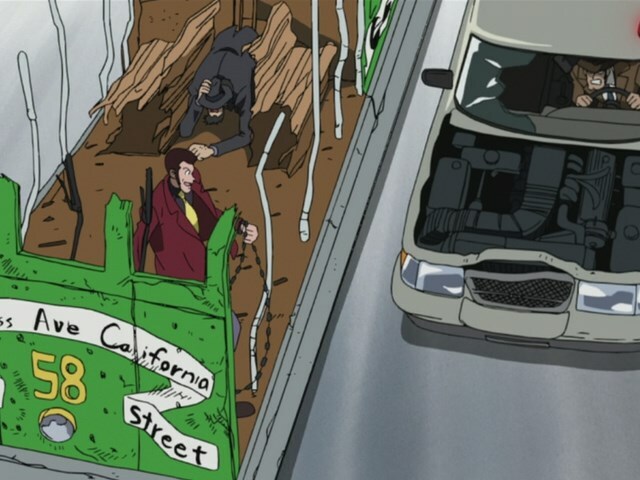 Zenigata and his San Francisco police partner Terry arrive shortly after the attack. Meanwhile, Lupin is taken to the lair of the mafia organization known as the Secret Seven for torture. Jigen helps him to escape, where the two board a trolley. The men in black give chase, as does Zenigata and the San Francisco police. Meanwhile, Detective Terry pays Fujiko a visit to extract info from her. 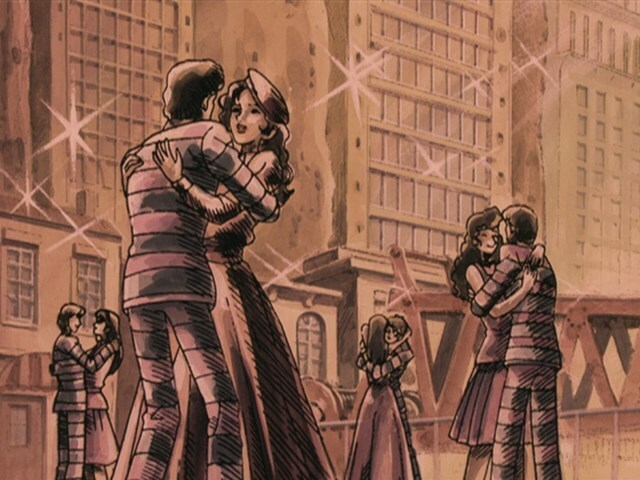 She gets away just as the trolley with Lupin and Jigen crashes into her residence. 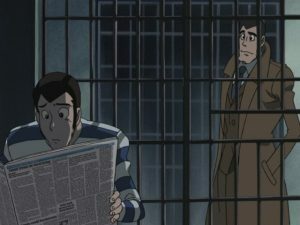 Lupin is arrested and thrown in jail. That night, Detective Terry comes to execute Lupin because Lupin knows too much about his Secret Seven organization. Terry shoots Lupin, then sounds the alarm, stating Lupin committed suicide. Zenigata shows up at the morgue, confirming Lupin isn’t dead. Lupin spills the beans and the two form a truce. 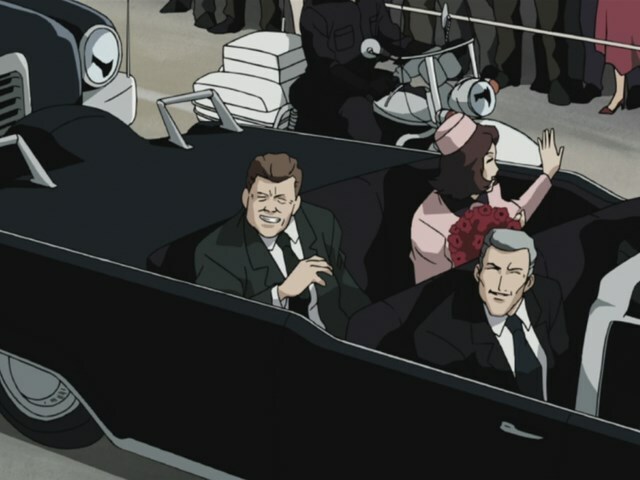 Zenigata takes the casket with Lupin in it to return to Japan, but they are attacked. Lupin finds a bomb on the hearse. He saves Zenigata’s life before crashing the car into a pond, where it explodes. Terry goes to Alcatraz, now dressed in a fancy suit. 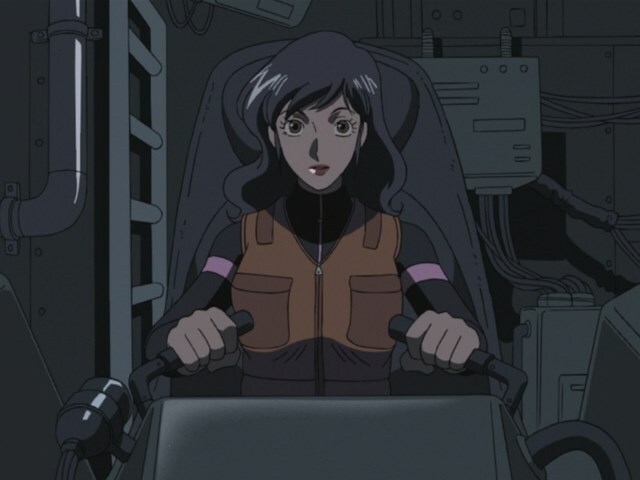 Fujiko is working for them, and will man the sub that can dive to 6000 meters where the Yankee Slade rests. 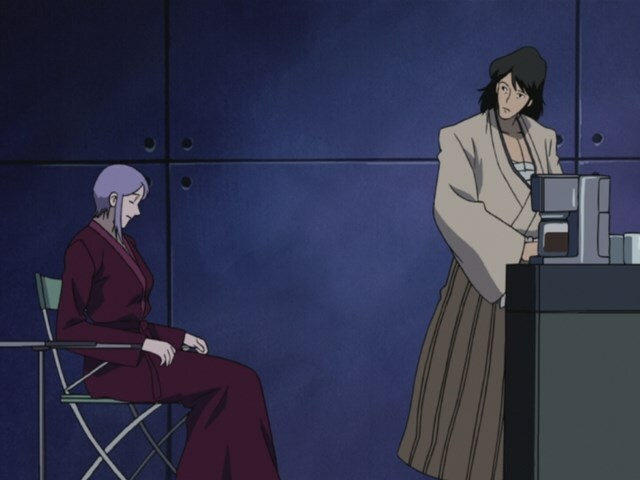 Meanwhile, Jigen and Goemon have to deal with two boss members of the Secret Seven, one being Goemon’s girlfriend. After dealing with them, Jigen and Goemon join Lupin on Alcatraz, where Zenigata also is. Deep under the old prison, they find a large city, which is where the inmates actually resided in luxury along with the corrupt guards. John and Robert Kennedy were assassinated for shutting down this paradise. The men in black, who are CIA agents, attempt to destroy the underground city, but fail. 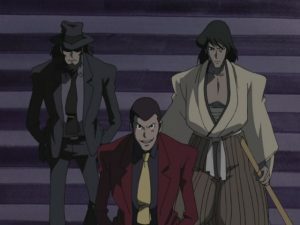 The surviving members of the Secret Seven find Jigen, Goemon, and Lupin waiting for them. Lupin says he knows the real treasure here–the actual evidence about JFK’s assassination. It was put into a fake gold bar and dumped into the sea where the Yankee Slade sank. 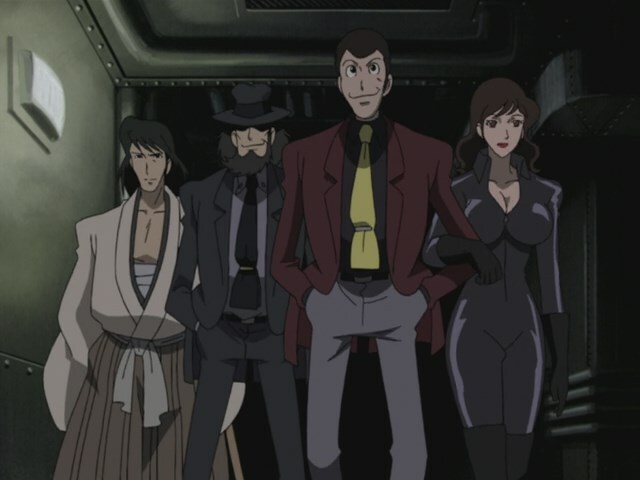 In the ensuing fight, the city is destroyed as Lupin, Jigen and Goemon jump into the mini-sub with Fujiko to escape. Fujiko has the fake gold bar, but has to get rid of the JFK evidence when the American military attack him and his group in San Francisco with a flight of Apache helicopters. The writers at TMS decided to make up a new conspiracy theory on why President Kennedy and his brother Robert were assassinated. It is laughable to think that the mafia crime bosses who were sent to Alcatraz created a large, underground “paradise city” where they could live in luxury and have all the hot women they could handle. For these crime bosses’ descendants to want to restore this paradise that JFK killed is even more laughable. The real reason Alcatraz was shut down was because it was so insanely expensive to run, thanks to it being isolated on an island. I can’t see a bunch of mobsters wasting an insane amount of money making a “paradise city” under the prison. One thing that is fairly common in older Lupin III titles is the use of “Lupin Physics.” This is where Lupin and company can do impossible feats without an explanation as to why they can do them. Certainly, Lupin III: Alcatraz Connection was filled with such moments. 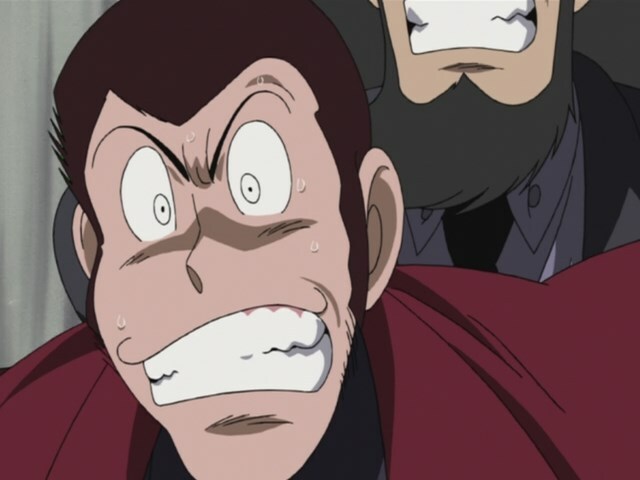 For example, when Lupin is tortured by one of the Secret Seven members, his head is put into a metal sphere. The sphere is then loudly banged with a hammer to torture him. Yet somehow, Lupin put earphones in and was listening to jazz. Comedy! A little later, a cobra is put into said metal sphere, which was then put on Lupin’s head. But for comedy’s sake, Lupin has killed the snake somehow. There were a ton more things like this, one really notable moment being Lupin and Jigen’s trolley ride through San Fransisco. Mostly, the Lupin Physics were used for slapstick comedy. Although it didn’t make me laugh, it did buy a fair amount of leeway with me. 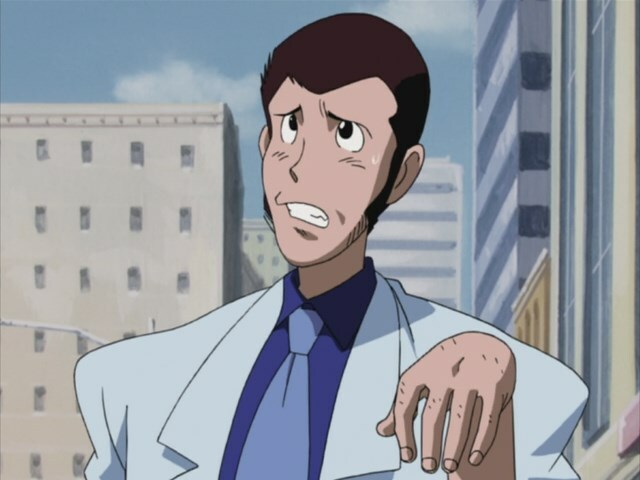 The one that made me cringe was when Lupin saved Zenigata by cutting a hole in the floor of the hearse. Then with perfect timing, Lupin shoves him through the hole as the hearse is traveling down the road at high speed. But magically, Zenigata goes down an open manhole and suffers no damage. This wasn’t done for comedy, so it really stood out. Goemon has very little to do in Lupin III: Alcatraz Connection. However, he suddenly develops a love for money because he’s suddenly dating a model. And his model girlfriend needs money ’cause “reasons.”And of course, she’s the only female member of the Secret Seven mafia organization. 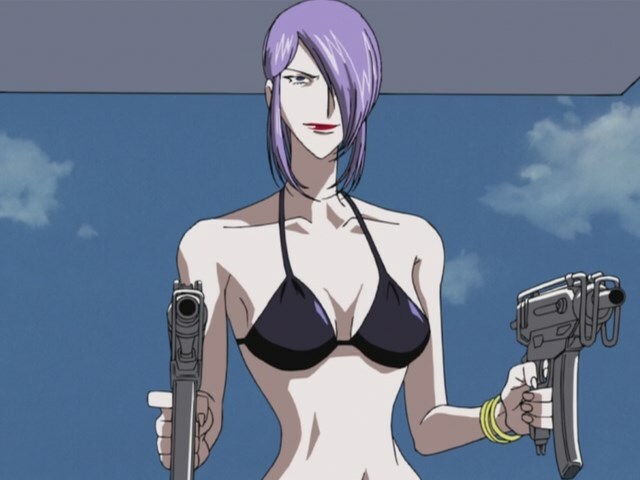 Naturally, her real objective in dating Goemon is to eliminate him, since Lupin and company are a threat to the Secret Seven. How she came to this conclusion prior to Lupin’s failed heist on the Machine Gun Kelley, who can say? But boy does she such at her job, since she went through the motions of dating Goemon rather than just eliminating him from the start. 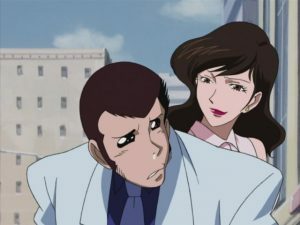 Because of the events in Lupin the Third Part 5, the relationship between Fujiko and Lupin stood out to me in Lupin III: Alcatraz Connection. 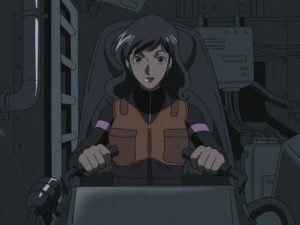 At one point, she states that she and Lupin have broken up as a couple. 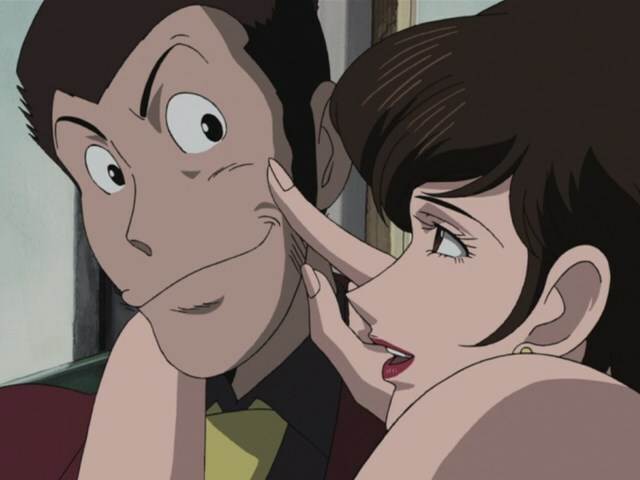 Of course when it comes to gold, Fujiko becomes quite loving with Lupin. Then at the end of the episode, Fujiko is all upset because after all this time, they got no cash, no gold, and no hidden evidence. Fujiko makes it seem like her biological clock is ticking and she doesn’t have a man, thanks to Lupin. 😅 It is a sharp contrast to Fujiko in Lupin the Third Part 5. 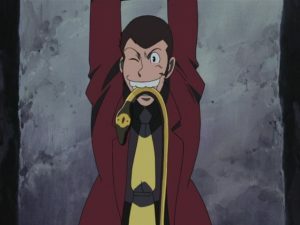 For the Discotek release of Lupin III: Alcatraz Connection, don’t expect much. The episode is in Japanese with English subs (which you can turn off). There were some liner notes as an extra, but that’s it. 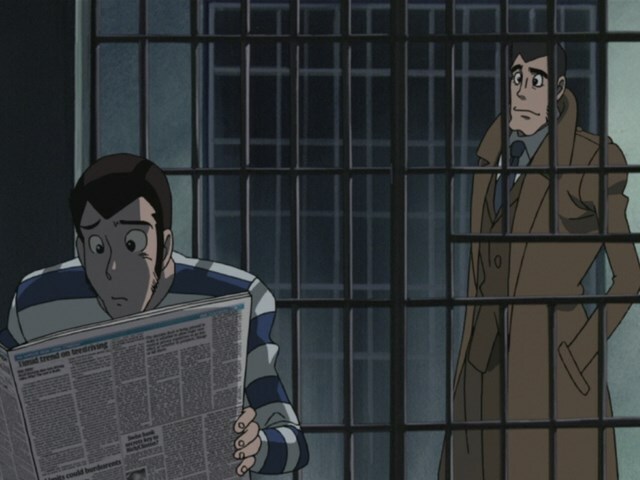 OK, I gotta wrap up my blathering on Lupin III: Alcatraz Connection. At times, the art and animation for the TV special were fine and at others, a little wonky. Another laughable thing I neglected to mention was how TMS had the Americans attacking four civilians in San Francisco with a flight of Apache helicopters. Sometimes, I wonder if the Japanese really think America is like this. I didn’t talk about Zenigata, but I did like seeing him allied for a bit with Lupin. And thankfully, Zenigata is no buffoon here. While I’m thinking about it, it was kinda strange hearing Goemon’s, Fujiko’s, and Zenigata’s original seiyuu doing their voices. Oddly enough, Jigen’s seiyuu sounded the best of the original lot. In the end, Lupin III: Alcatraz Connection is an hilariously stupid, silly show that has a laughable plot, slapstick comedy, and is basically just a time sink. Frankly, I doubt I ever watch this TV special again, even though I will say I was somewhat entertained by it. 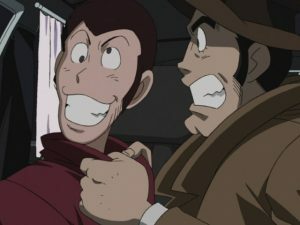 I always like to think that Lupin and Zenigata would have some sort of a father and son relationship, and there were some moments in the story that confirm it. Do you want me to point them out? I know what you are saying in regards to a father-son relationship. I personally have never seen it this way. For me, it has always been a matter of mutual respect. Zenigata respects Lupin for being so crafty as to elude him (most of the time) and Lupin respects Zenigata for being the only cop who can keep up with him. Alcatraz Connection was literally the first episode of the third series bloated to feature length. The writers must have been desperate for ideas. While I’m thinking about it, it was kinda strange hearing Goemon’s, Fujiko’s, and Zenigata’s original seiyuu doing their voices. Oddly enough, Jigen’s seiyuu sounded the best of the original lot. .
Kiyoshi Kobayashi, Jigen’s seiyuu, is like the Bob Mitchum of voice acting. He’ll sound cool even if he’s 100. Goro Naya (Zenigata) is the seiyuu I miss the most. He’ll always be Tottsan to me ! Alcatraz Connection was literally the first episode of the third series bloated to feature length. Hahaha! I had to refresh myself on that first episode, but you are right. They just modified it to fit the Red Jacket stories and then massively expanded it out. Kiyoshi Kobayashi, Jigen’s seiyuu, is like the Bob Mitchum of voice acting. He’ll sound cool even if he’s 100. When I watched this episode, I could certainly tell that his voice sounded younger. I do wonder if they can get someone really good to replace him. 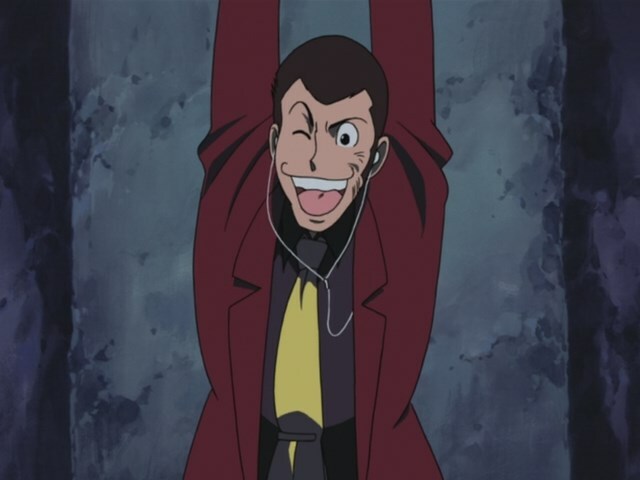 Goro Naya (Zenigata) is the seiyuu I miss the most. He’ll always be Tottsan to me ! I’m used to the new seiyuu for Zenigata, but yeah, Goro Naya will always be best. Please don’t stop 🛑 doing Lupin the third reviews on this website. I won’t stop. I just don’t know when the next one will be.